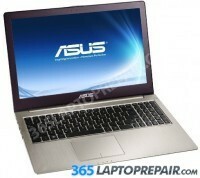 You can also check out our teardown blog post for this laptop. The replacement service that we provide for the Asus Taichi 21 includes the cost of a brand new LCD screen and the labor to install it. This service also comes with a No Dead Pixel Guarantee and a 6-month warranty on parts and service. We use genuine new LCDs, not aftermarket or cloned products. This laptops LCD bezel is held in place with glue, so it is more complicated than most other screen replacements. We can replace the LCD, however due to the complexity of the repair, there may be a small chance that you may be able to notice small imperfections in the bezel that covers the screen. Because of this, we recommend replacing the entire screen assembly for a like new cosmetic condition. Please request a Custom Quote this repair. This laptop comes stock with a 1TB hard drive. This laptop comes with 4GB of integrated memory and a 4GB memory stick for a total of 8GB. You can upgrade to 12GB. The DC jack for this laptop is soldered to the motherboard.